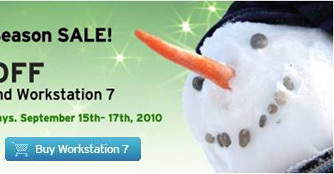 If you have been waiting for the perfect time to purchase or upgrade to VMware Workstation 7, now is the time! 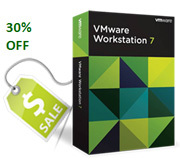 For 3 days (9/15/10-9/17/10), you can get 30% off VMware Workstation 7 and VMware Workstation 7 upgrades in the VMware online store. Not ready to buy. Download the free VMware Workstation 7 30-day trial here. This entry was posted in Uncategorized on September 15, 2010 by Michael Paiko.